Ichiriki wins Ryusei: The Ryusei is a TV tournament using the NHK format, that is, the time allowance is 30 seconds a move plus ten minutes extra time to be used in one-minute units. The preliminary tournament actually allots more time: one hour per player plus one-minute byo-yomi. The final of the 27th Ryusei was telecast on September 24 (the game was played on July 23). 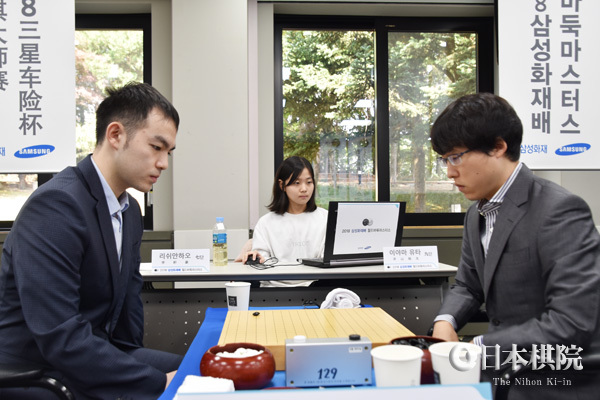 It paired two top young players: Ichiriki Ryo 8P (aged 21, right), who won the 25th Ryusei, and Motoki Katsuya 8P (aged 22 when the game was played, but now 23), who challenged for last year’s Honinbo title. Taking black, Ichiriki won by resig. after 231 moves. The prize money is six million yen (about $55,000). 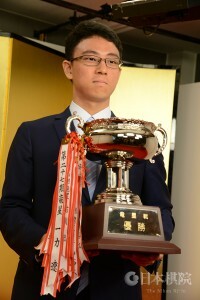 Until now, the winner of the Japanese Ryusei played the winner of the Chinese Ryusei, but a Korean Ryusei tournament has also been founded, so it will be expanded to a three-way play-off. Round 1 (Sept. 21). Fan Tingyu 9P (China) (B) beat Kyo Kagen (Xu Jiayuan) 8P (Japan) by resig. ; Yamashita Keigo 9P (Japan) (W) beat Wang Yuanjun 8P (Chinese Taipei) by resig. ; Gu Zihao 9P (China) (W) beat Murakawa Daisuke 8P (Japan) by resig. ; Park Junghwan 9P (Korea) (B) beat Ichiriki Ryo 8P (Japan) by resig. ; Peng Liyao 7P (China) (W) beat Motoki Katsuya 8P (Japan) by resig. ; Tang Weixing 9P (China) (B) beat Yo Seiki (Yu Zhengqi) 7P (Japan) by resig. Round 2 (September 22). Gu Jihao (B) beat Yamashita by resig. NOTES: First prize is 2,000,000 yuan (about $290,000). The time allowance is two hours each plus one-minute byo-yomi x 5. This is China’s fifth international tournament, according to Go Weekly, which also noted that out of its 13 players in Round 1, 11 have won world championships. The depth of Chinese go is staggering. Of Korea’s six representatives, four have won world titles. Lee Changho of Korea, who in the 90s and early 2000s dominated world go, winning an unrivalled 21 international titles, made a rare appearance in this tournament. He is now 43. He lost to Xie Erhao 9P of China in the first round. Both Iyama Yuta and Shibano Toramaru, who are usually sure selections to represent Japan, were too busy to take part. You have to assume you might win all your games, so you have to set aside six days plus travel time, which for Iyama is certainly not easy. 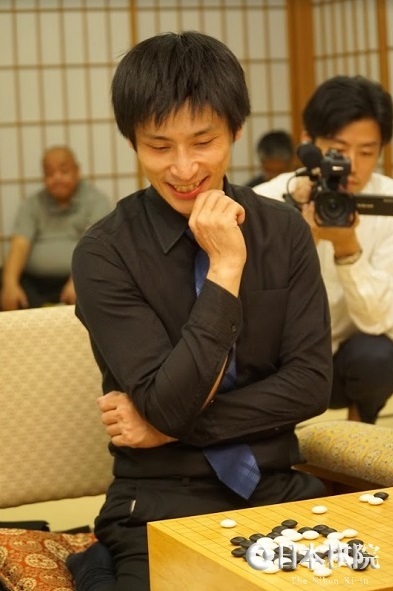 Cho picks up first win in Meijin challenge: The third game of the 43rd Meijin title match was held at the Shiroyama Hotel Kagoshima in Kagoshima City, Kagoshima Prefecture, on September 25 and 26. It’s become a commonplace to observe that fighting starts earlier in professional games than in the old days, but even so the no-holds-barred aggression on display in this game was impressive. And it didn’t let up. In the midst of all the fighting, Cho U (left) steadily racked up some small gains and by the end, on move 278, had a lead of 4.5 points, which is considered a convincing win among professionals. After his bad start, Cho would have been relieved to get a point on the board. The fourth game will be played on October 10 and 11. Kisei play-off tournament starts: The first game in the knockout tournament to decide the challenger for the 43rd Kisei title was held on September 27. Taking black, Onishi Ryuhei 3P beat Shibano Toramaru 7P by 4.5 points. In the next game, Onishi will play Murakawa Daisuke, the winner of the A League. Shibano and Onishi are both 18; the former has attracted more attention recently, but, as this result shows, he has rivals in his own age group. The two are sometimes bracketed as “the dragon and the tiger,” as “tora” in the former’s name means “tiger,” and “ryu” in the latter’s means “dragon. ” Shibano is on top of the “most games won” list this year, with 40-15, but Onishi is in second place on 34-6; the win against Shibano was his 14th in a winning streak that’s still going. 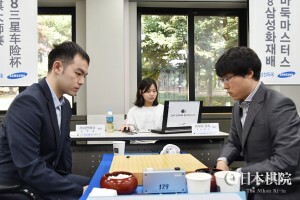 Iyama wins in Samsung : On the point of submitting this report, I learned that Iyama Yuta won his game in the round of 16 in the Samsung Cup, held on October 1. Taking black, he beat Li Jianhao 7P of China by resig. In the quarterfinals, hold on October 2, he will meet Xie Erhao 9P (China), who beat him 2-1 in the 22nd LG Cup final played in February this year.